3,600 Sq. Ft. - 1/4 Acre Double Lot - Game Room w/Pool Table - Furnished Screened Covered Patio - Heated 15'x 30' Pool - Walk to Shopping Center/Houses of Worship - 10 Beds - Sleeps up to 18 - Beach 5 Miles! To return map to the property location cross streets (S 48th Ave & Jackson St) select here. To see a panoramic street view of Casa Del Mar, select here. Our Casa Del Mar property is a 3,600 Sq. Ft. 5BR/2.5BA home w/heated pool on a large fenced corner lot featuring wood flooring throughout the majority of the home, a separate living room, dining room, family room and game room (5th bedroom). We are located on Jackson Street in the established affluent neighborhood of Hollywood Hills in Hollywood, Florida. The kitchen is equipped with service for 18 as well as all the pots, pans, cookware necessary to create your own gourmet meal. We feature an electric stove, a microwave, a double oven, dishwasher and a side by side stainless steel refrigerator with filtered water and ice dispenser. The eat-in kitchen also features a large sliding glass pass-through window to the patio. The open and airy dining room area which is adjacent to the kitchen features a beautiful wood table with seating for eight and chandelier. A large french door provides access to the pool/patio area. The entry welcomes you to the foyer with a half bathroom then you step down into the spacious 22' x 13' living room area that features comfortable seating; a queen size sofabed couch, loveseat and chair. The 20' x 18' family room contains a large sofa sectional with seating for 8 and a full size sofabed. There is a big screen TV, PC Computer area with desktop pc and printer and a beautiful view of the pool/patio area through french doors. The family room also features over 100 Cable Channels, a PlayStation 2 and 50+ DVDs. The large 18' x 17' master bedroom features a king size bed with a spacious sitting area that includes a side chair and a laptop table, a lighted ceiling fan, a walk-in closet, a mirrored dresser with two night stands, a private bath and a Flat Screen HDTV w/DVD player. Pool/Patio French Door Access. The master bathroom has a large countertop with one sink and a large vanity mirror with plenty of lighting. There is also a window, two person shower, a heat lamp and a linen closet. The 16' x 16' 2nd bedroom features two queen size beds, a sitting chair, a night stand, large windows to allow plenty of natural light and a lighted ceiling fan to keep you cool. There is a Flat Screen HDTV with DVD player provided. The 18' x 16' 3rd bedroom features two queen size beds, a night stand, large windows to allow plenty of natural light and a lighted ceiling fan to keep you cool. There is a Flat Screen HDTV with DVD player provided. The 12' x 14' 4th bedroom features one queen size bed, two night stands, one large window to allow natural light and a ceiling fan to keep you cool. There is a Flat Screen HDTV with DVD player provided. The 2nd bathroom is very large and features his and her sinks, two large vanity mirrors, overhead heating lights, a bathtub/shower combination with glass shower door, linen closet & patio access (cabana bath). The 20' x 25' Gameroom (5th bedroom) contains an 8' pool table, a 6-in-1 air hockey/foosball table and a bistro set. In addition, there are two leather covered full size futon beds, a closet area, a separate A/C wall unit, IPOD stereo system and a wall mounted HDTV. High Speed Internet access is provided by the workstation on site and wireless access is also available; bring your laptop and connect freely. Unlimited U.S., Canada & Puerto Rico phone calls via 3 cordless phones. In the home there is a small freezer, washer/dryer, iron and ironing board. Outside you will find plenty of seating under the 45' x 12' covered balcony with 3 ceiling fans, 8 patio chairs (1 lounger), outdoor dining set for 4, gas barbecue grill, outdoor cooler w/bottle opener, queen size futon, outdoor shower and cabana bath. The large 15' x 32' heated pool is so inviting, you'll never want to get out! The screened enclosure is 25' x 45' and behind the pool there is a separate enclosed fenced yard to allow the kids to play freely yet safely. Located within walking distance (just 3 blocks) is a CVS Pharmacy, BlockBusters Video, Piccadilly Restaurant, Rickey's Lounge, Dominoes Pizza and various cozy restaurants. Also located just a mile away is the Oakwood Plaza (the largest open air shopping center in South Florida) anchored by Regal Oakwood 18 Cinema, Dave & Buster's, Home Depot, BJ's Wholesale, Big Kmart, Big Lots, Barnes & Noble Booksellers, Marshalls, Office Max & Old Navy. Located just 15 minutes away is the Seminole Hard Rock Hotel & Casino featuring over 2,500 of slots & games and now featuring Vegas-Style Slots! They have all of your favorites including Video Poker, Video roulette, Video keno, Video black jack, Cleopatra, Enchanted Unicorn, Hexbreaker, Little Green Men, Hot shots, Blazing 7’s, Spam and Wheel of Fortune plus classics like Double Diamond, Red, White & Blue and Five Times Pay. Whether you like to play pennies or much more, they have a machine that'll suit you perfectly. Hollywood’s oceanfront Broadwalk offers miles of carfree enjoyment. Walkers, runners, bicyclists and rollerbladers set their own pace on this path, which is bordered by six miles of Hollywood’s famous coastline, boutique hotels, charming shops, cafés and places to eat facing the ocean. We are located just 3 miles away! Hollywood - Fort Lauderdale International Airport is only 15 minutes away and Miami International Airport is just 35 minutes away. Only five minute drive to downtown Hollywood, 15 minutes to downtown Fort Lauderdale & Las Olas area and only 25 minutes to trendy South Beach! More importantly, we are centrally located between Miami and Ft. Lauderdale offering access to all that south Florida has to offer. We are just 3 miles west of Hollywood Beach, with its famous boardwalk, restaurants and shopping! Hollywood Vacation Rental - Hollywood, SE Atlantic Coast, Florida, United States - Hollywood Hills area, minutes to beach and broadwalk, minutes to downtown restaurants and nightlife. 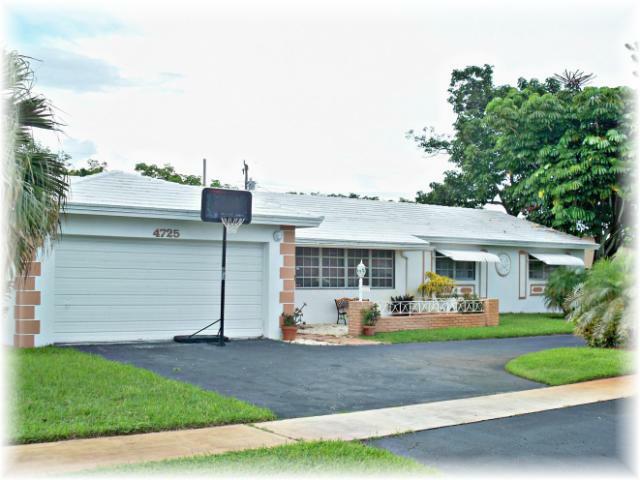 Excellent Location centrally located to all South Florida has to offer! Home --- 5 Bedrooms, 2.5 Bathrooms, 3,600 Sq. Ft. - Screened Heated Pool, Outdoor Shower, Cabana Bath, Gameroom, large family room, fully equipped kitchen, fenced garden with covered patio. Plenty of space and seclusion - Sleeps up 18 (1 King Size Bed, 5 Queen Size Beds, 2 Full Size Futons, 1 Queen Size Sofabed, 1 Full Size Sofabed). Please note all TV's receive Over-The-Air HDTV Signals that provide 35 local channels (PBS, CBS, NBC, ABC, FOX, CW, Etc.) in High Definition. In addition, the Family Room TV provides over 100 Cable Channels. Casa Del Mar is proudly listed with VRBO & HomeAway.